Tuesday, Sept. 13, was set aside for North Webster Elementary School fourth-graders. First item on the agenda, after getting off the school bus, was lining up along a table to view fly larvae and other invertebrates in water with a magnifier. 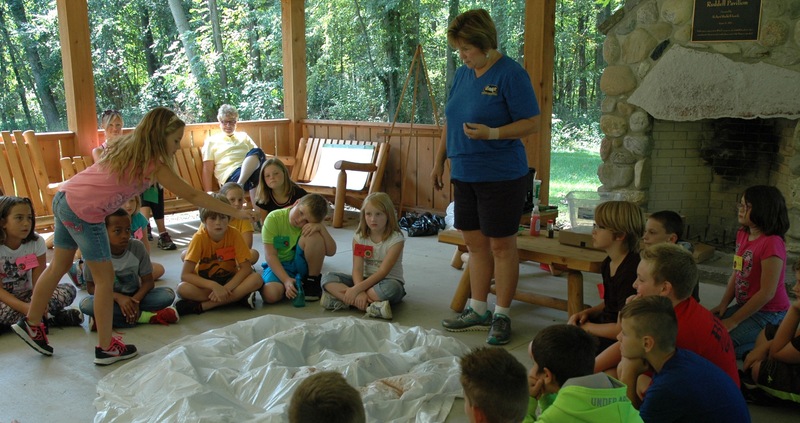 Pam Schumm allows the North Webster Elementary School fourth-graders to add pollutants to the watershed. Secondly the students sat together in a circle surrounding a large piece of plastic placed over newspapers. Pam Schumm, retired teacher, described this represented a watershed. She explained that, although the students are in Indiana, this watershed could represent any land anywhere in the world because watersheds know no boundaries. Rain, created by students with water bottles, made lakes and rivers among the hills of the watershed. Then humans came to inhabit the land and brought soil runoff, fertilizers, toxic waste, oil, soap and fishing line which the students demonstrated using everything from food coloring to sprinkles. More rain then came to the land and, just like a funnel, a great deal of it ran downhill into the rivers and lakes. Schumm followed up by pouring water into a clear container and telling a story of this lake. In the lake beavers, boats and sunbathers were just a few who left behind items in the lake. Students were given containers with a name on it and, as the story progressed, each student would pour the container’s contents into the lake. By the end of the story, the makeshift lake smelled and none of the students wanted to swim in it. The students then broke up into five groups for the five stations manned by WACF members and volunteers. Each group rotated throughout each of the stations to learn a little more about protecting the land from pollution. The first station was labeled “Mayhem” and each student was told to choose a bucket, act as that macro-invertebrate and given between one and four lifelines. Cards were laid out on the ground with certain types of food that each could eat and each student was also given a specific way in which they were to move, such as spin or walk sideways. While collecting the proper food, however, pollution would come and try to steal the lifeline. Parents joined in the learning and fun at WACF’s Bug Fest 2016. 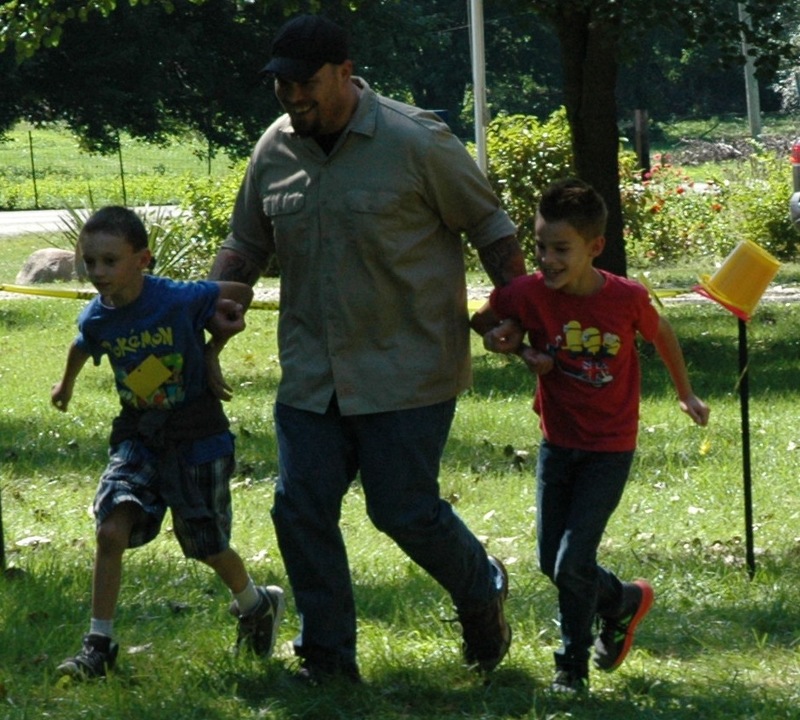 The second event was the “Six-legged Race” in which students learned the difference between insects and arthropods. They were then teamed up and linked arms to create a six-legged creature and were told to only collect pictures of insects. The third station, labeled “Cocoon” showed metamorphosis and caterpillars during the pupae stage. Students demonstrated this by wrapping a few chosen students up in a toilet paper cocoon. The fourth station, “Bug Juice,” gave each student a juice box and made them kneel with their hands behind their back to show how bees and butterflies use their proboscis to drink and see who could drink it the fastest. The fifth station, called “Camo Caterpillars,” involved a relay race to collect Rotini noodle caterpillars as the students acted like adult birds with a baby in the nest and how caterpillars use their color as camouflage. By the end of the day, students all agreed the best and easiest way to prevent pollution is to not put pollutants in the land and water.